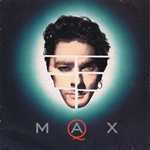 Max Q released their sole self-titled album in 1989 and had minor hits with the songs "Sometimes" (originally recorded by Olsen with Orchestra Of Skin And Bone) and "Way of the World". The album was more critically-acclaimed than commercially successful, and ever since it went out of print, it has yet to be re-issued. Also, the band had never performed any live shows. In October 2006, two Max Q songs were featured in the Triple M Essential 2006 Countdown which had been voted by listeners. "Sometimes" was ranked 1301 out of 2006 songs and "Way of the World" was ranked 716.